What to look for when accepting an apartment in a new building, how to prepare and protect your interests? Experts of the real estate market and construction specialists advise not to lose sight of anything: starting with the verification of information in the contract with the technical characteristics of the finished premises and ending with checking the quality of materials, works and the quality of their performance. And always defend their rights. can be rented Apartments in new houses are rented both without finishing, and with draft, and finishing (turnkey repair) Since there are buyers for each of these options for availability of premises. Unfortunately, there are still no uniform requirements for each of the types of finishes. For example, declaring the delivery of apartments with a rough finish, the developer may have in mind the "bare", but smooth (plastered) walls and nothing more. Another is to take care of the installation of doors, wiring engineering networks. Of course, there is a minimum list of works, prescribed in regulatory documents, but everything else is at the discretion of the developer and at the request of the customer (prescribed in the agreement between the parties). Letting residential premises to new owners without finishing means that the construction company has done only wall-building, facade cladding, and no internal work has been done. Electrical wiring, installation of plumbing fixtures, final finishing were not carried out. 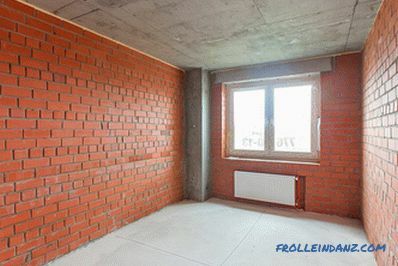 Taking such an apartment, real estate investors will see walls of brick, panels or reinforced concrete (depending on the type of building), without any coating. The same applies to interfloor partitions (ceiling and floor). Space for connecting water supply, wiring. As a rule, installed meters, radiators, fire protection system, double-glazed windows on the windows and metal entrance doors. And in some, on the contrary, even interior partitions are not provided. 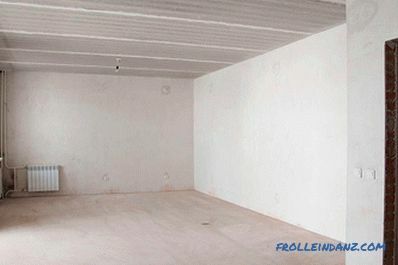 Draft ("pre-finishing") finishing - an intermediate option, within which the minimum work on the preparation of the room: the intermediate layers before the final finishing walls, partitions (plaster, screed, waterproofing in bathrooms; without it, fungus and mold will quickly appear in rooms with high humidity). Sometimes the list of works includes plumbing and electrical wiring (but without installing plumbing). plaster and whitewash on the ceiling, either stretched or HL ceilings. Since the surfaces are covered with the final layer of finishing, sockets, and, preferably, interior doors, and plumbing should be installed in such an apartment. If the project did not include interior partitions, when ordering the finish from the developer, they will be built and decorated. 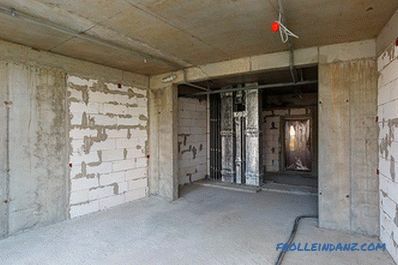 How to take an apartment in such conditions, when there are no clear requirements for the condition of the premises, and developers on their sites offer "comfortable housing", not always prescribing the degree of readiness of the premises? Before you decide on the acceptance of the apartment, you need to carefully examine the documentation (project declaration and equity agreement), the project site, explore the demo apartment. Then the acceptance will not be a complete disappointment. After you receive an invitation from the developer for acceptance, you should take care of collecting the necessary documents. You must arrive at the site with a passport and an equity agreement. If the equity holder cannot come himself, then he has the right to grant the right to represent his interests to another person (in this case, one must also present a notarized power of attorney). It is also worth preparing an apartment plan from the developer and a plan from BTI in order to compare the declared characteristics of the room with the actual ones. 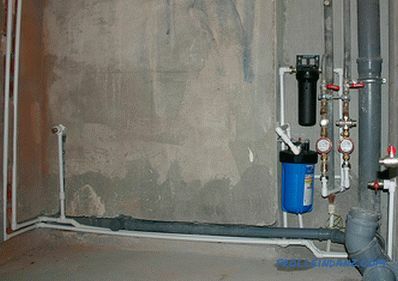 It is necessary to request from the developer and the "act of hidden works", which reflects information about the laying of communications, so you know where they pass (the pipeline to the radiator can be hidden under the floor screed, electrical wiring under the suspended ceiling or in the partition). The developer should take care of the possibility of drawing up a so-called defective act (or a viewing sheet - an annex to the transfer act). This document is drawn up at the time of acceptance in the event that the real estate investor has identified violations (significant or not). In order to avoid misunderstanding, defects should be described in as much detail as possible. Also it is necessary to indicate in it the terms for elimination of significant defects (if any).After drawing up and signing the defect act, each of the parties must receive a copy (the signature of the representative of the developer must be present on your copy). Then an act of acceptance and transfer of the apartment. It provides the developer. Mandatory information in it - mailing address indicating the apartment number, size of rooms and cost. The document after signing remains with the shareholder, with it the apartment buyer will be able to register the property rights. the shareholder puts his signature if he agrees to accept the dwelling in the form in which it is. If there were significant violations in which it is not possible to live in an apartment, the act is not worth signing. For example, malfunctioning of the sewage system, holes in the wall, broken entrance door. Demands should be corrected within a reasonable time (for example, two weeks, but the maximum time limit is 45 days by law). The developer may, instead of eliminating the irregularities, offer compensation to the interest holder. Only after the parties reach an agreement will it be possible to accept an apartment. Otherwise, all existing and not eliminated defects by the developer will have to be eliminated by the shareholder at his own expense. If there are insignificant violations, the act is signed, but in its appendix “Inspection Sheet” all defects and dates to which these defects should be eliminated are indicated. If you refuse to sign the act in case of insignificant violations, the developer has the right two months later to sign a unilateral act, according to which the apartment will become your responsibility. In case of successful signing of the acceptance certificate, the owner can independently obtain an extract from the USRN and conclude an agreement with the management company with it. Do not sign the act until you have examined all the rooms. The developer may offer to sign all documents without inspection, in order "not to delay the process." You should not agree to such a proposal. If you sign, the developer will avoid responsibility for all shortcomings left after construction. Their elimination will fall on your shoulders and can "fly into a pretty penny." Apartment acceptance is a very exciting and responsible process. Of course, the long-awaited housing you want to get as quickly as possible, but remember that it is equally important to get a quality home in which you can actually live. During acceptance, you can identify violations and request their elimination. But for this you need to properly prepare. Prepare a list of what should be checked (quality of work, finishing, construction defects, serviceability of engineering networks), so as not to forget anything. To check, you will need: a smartphone and charging to it, a flashlight, matches, a light bulb, a tape measure, a level. The charger is useful for checking outlets, a flashlight for dark corners in the bathroom, matches will help to check the hood, and a light bulb - the operability of lighting devices. It is also useful to have a pen to record the violations found (and if the developer does not provide a viewing sheet, you will also need paper). And remember, you have the right to fix bugs with a photo or video. Make an appointment with a representative of the developer only during the daytime. At dusk it is difficult to notice even the most obvious marriage. And last but not least, the preparation is the attitude. Tune in to be extremely attentive. Begin to show the wonders of observation from the moment you enter the staircase (if here, in a prominent place, the developer allowed the marriage, then "surprises" may await you in the apartment. And get ready to defend your rights, if you are not satisfied with the quality of the rented room, reflect this in the viewing sheet, describing the violations. A number of different residential properties are represented on the primary market. Every year the offers of developers sound more attractive. But in fact, apartments do not always correspond to the promises. 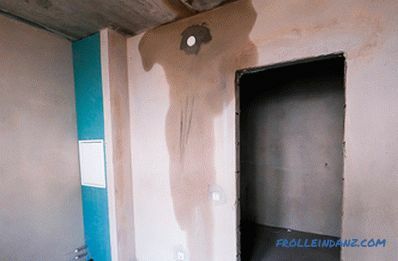 How to take an apartment in a new building without finishing at the developer? What moments are unacceptable, because of which you can refuse to sign on the act of acceptance and transmission? In such an apartment, it is necessary to check quite a few - the walls, the ceiling and the floor for compliance with building codes. We check the walls for uniformity of composition, leaktightness of the joints, as well as how aligned the corners and the surface itself is. Examine walls for foreign inclusions, such as debris. Sometimes steel pins or wires stick from the walls, which are used to build walls.In general, they should not be, but later, when plastering walls, all the excess can be cut off (if left, the metal can rust, orange dots appear on the surface). Make sure that there are no large gaps that are visible in the light. Such gaps in the joints between the seams of panels or blocks can be considered a gross violation of modern construction standards. What kind of comfortable operation can we talk about in such a room? And it's not just about drafts, ice and high heating costs. But also about security requirements. Masonry brick or blocks must be of high quality: smooth rows, identical seams, well-sealed, without the influx of mortar and voids. 3. Alignment of the surface, perpendicularity of angles, deviation from the vertical. Check how flat the wall surface is. Only insignificant deviations of the plane are allowed - 1 cm, over a length of 3 meters in height or length. Significant vertical deviations are noticeable to the "naked eye", but testing can be done using the building level. The air bubble inside the measuring tool should be in the center, which means that the wall is flat. Allowed deviation from the vertical not exceeding 2 cm to the height of the floor. With a tape measure, you can compare the width of the opposite walls or the length of the visual diagonal line to make sure that the walls are perpendicular. 4. Dark spots and traces of moisture penetration. If you see wet stains on the walls on a wet day, there is reason to doubt the quality of the facade cladding. Responsible developers are trying to use quality materials that are not exposed to weather conditions. Because they know that poor-quality exterior finish will lead to the appearance of mold and dampness, which in turn "tarnishes" the reputation of the developer. But, before you make hasty conclusions, make sure that the cause of the wetted walls is precisely the poor-quality exterior cladding, and not a simple leakage or condensate due to the glass unit adjacent to the wall. If the acceptance takes place in winter, you can easily notice the main sign of poor insulation of the walls - dark spots appear in the corners or even bloom (the wall freezes through). 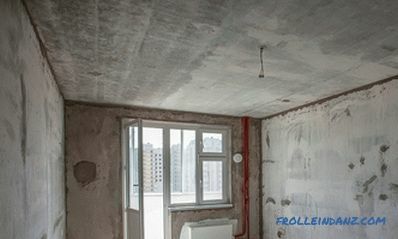 Ideally, the ceiling and floor should be uniform in composition, without dents and grooves, cracks and voids, floor slabs should be laid at the same level (seen at the joints). It is also worth measuring with a tape measure the height from the floor to the ceiling in order to compare with the developer stated in the project documentation. 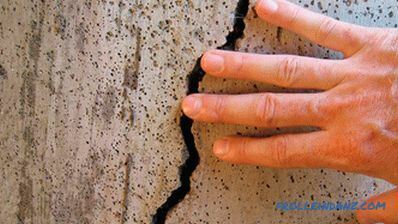 Inspect floor slabs for serious cracks (over 2 mm). A fine mesh of cracks is permissible - this is the result of shrinkage after concreting. But the cracks rolling on the walls are a serious cause for alarm. A serious disadvantage is the dried-up parts of the formwork that the builders had to remove. Also a significant drawback is the exposure of the armature, as well as a large number of sinks in ceilings 5 ​​mm deep and more. Floor screed is not easy to make. If all the necessary steps are observed (including measurements of the construction level), the result will only please. Any floor coverings will easily fall on a flat surface. Otherwise, you will encounter inconveniences that darken our living in a new apartment: rolling down the sloping balls, wobbling table, one leg of which does not reach the floor, because it is not level, etc. Check the tie for uniformity composition, uniform color and lack of voids. Tap the layer, the sound of the blows should be ringing, but firm. Bubbles in the screed, bumps or, conversely, layer destruction and crumbling testify to the poor quality of work. This should look like a well-made floor screed. Accepting an apartment in a new building with finishing in many cases ends with disputes and dissatisfaction of co-investors. Since there are many moments where builders may be mistaken or not guess the desires of customers. How and what to check in an apartment with decoration? Plastering walls, floor screed - these are complex and responsible processes. Inexperienced brigades and those who start these types of work for the first time do not cope with the task. The result is uneven surfaces and sometimes so uneven that no wallpaper with geometric, i.e. distracting attention, pattern will hide the lack of finishing finishing. Therefore, it is necessary to take measurements. 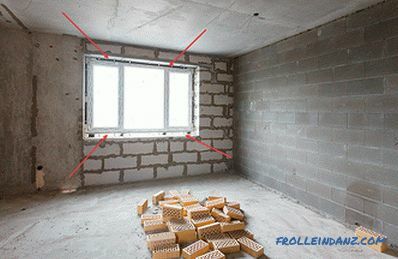 Be sure to check the vertical deflection of the walls and their perpendicularity.Pay attention to the unevenness of the floor and ceiling. Keep in mind that defects may increase over time. 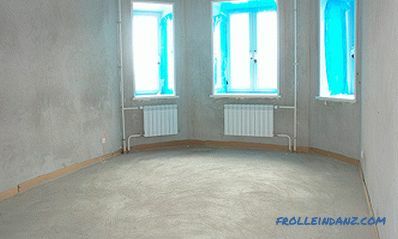 If you already see significant irregularities in the flooring, they will appear even more during operation. All real estate investors, without exception, want to see modern expensive finishing coatings and structures in the apartment. 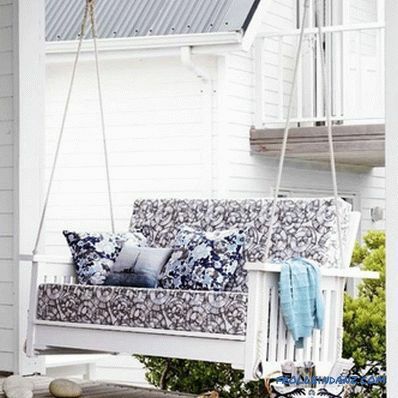 If we are talking about an economy class house, everyone understands that it is not necessary to rely on high-quality material. However, for buyers of apartments in residential complexes comfort and business class deficiencies of finishing materials will already be important. Unfortunately, many developers, in trying to avoid claims and disputes, do not prescribe clearly what materials will be used in apartments intended for delivery with final finishing. And those of the few who register, add the following phrase: "the developer reserves the right to change the brand or variety of finishing materials to the same, without sacrificing quality." If there is no compliance with the actual materials used with the declared ones, but there is this addition, you will not be able to make claims to the developer. In any case, if there are serious doubts about the quality of materials and their origin, you are entitled to require the developer to submit documents containing information about manufacturers. If the developer clearly described which finishing materials will be used and which equipment the company will be installed without any reservations, then it will be easy to determine at the acceptance whether the company should to the word. In order not to be deceived, we will reconcile with the information specified in the annex to the contract. 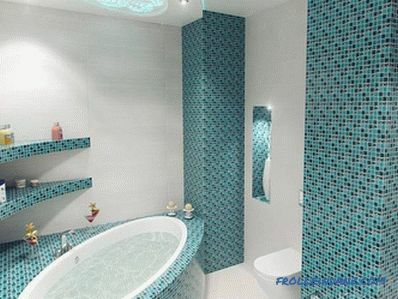 Check the brand of plumbing, doors, windows, type of finishing materials. For example, if it turns out that a metal door is not installed in the apartment, but a wooden door is a serious reason for refusing to sign the act of acceptance. How well did the builders work? How smooth and without grouting the grout, whether the pattern of the wallpaper matches, how harmonious each tile in the row looks, etc. Whether there are mechanical damages. Whether the workers damaged the tiles, scratched the laminate, the window frame, and if there were any holes in the sink. Whether the construction debris is removed, the results of excessively hard work are removed. For example, are there any traces of plaster on the window frame and on the glass. Checking the area and planning for compliance with the stated parameters is worth it, since a significant deviation from the terms of the contract will lead to the purchase of an actual other object. If you chose one apartment, but in fact received a completely different one - this is not just a flaw, it is a serious violation of the terms of the contract. Especially it is worth being vigilant if you are suddenly asked to sign an additional agreement: it may be that the “updated” data, including the new cost of an apartment (including additional meters), may be in it. 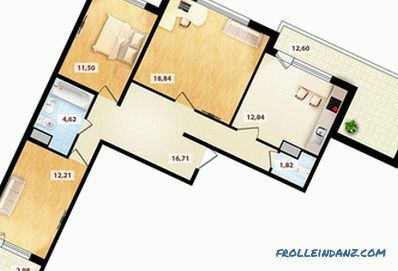 The actual area of ​​the rooms and other rooms can be checked with the floor plan and with the annex to the contract, which reflects the layout of the apartment. The BTI floor plan also contains information about load-bearing walls and the presence / absence of partitions. Verify this information with reality. "Stories" are known cases when the apartment lacked 2-3 walls. As well as cases when the developer tried to transfer the dwelling, which is radically different in layout from the stated characteristics. It is difficult to call these violations irrelevant. If engineering equipment is installed in the apartment, plumbing work has been carried out, check the operation of all systems, the reliability of fasteners, the tightness of joints in the pipeline, and the gas pipeline welding and availability counters. If this is not done after a week or a month, you may find a serious malfunction, which you will have to fix at your own expense with the assistance of expensive specialists. It is not enough to check the availability of the counters. Make sure they are sealed and the seals are intact. If the condition of the counters is not satisfactory, it is worth writing the corresponding application to the developer and asking him to eliminate the violations. Take readings from each (consumption of electricity, gas and water at the date of acceptance). During this procedure, a representative of the developer must be present (engineer, concierge or foreman). If the reading was successful, the act of commissioning the metering devices and the metering certificate of the meter readings are signed (provided by the developer, transferred to the buyer). Together with the acts of the owner are given a technical certificate for all metering devices. Make sure that the numbers of the counters indicated in the passports correspond to the devices installed in the apartment. 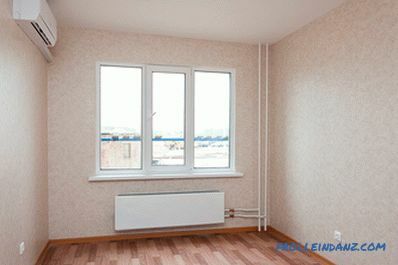 in compliance with the installation rules of the heating device (2 cm from the wall, 8 from the window sill, 7 - from the floor, otherwise the heat transfer will be disturbed and the residents will constantly freeze). Temperature regulators must be intact, easy to turn. 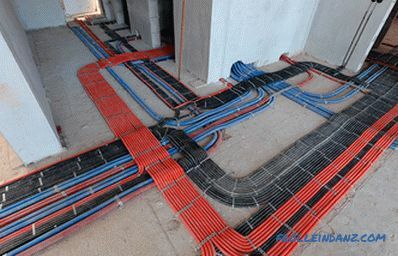 If a pipeline is supplied to the radiators along the floor (under the screed), it must be insulated with insulation. In the water supply and sewage system, the most important thing is to check for leaks (there should be no leakage at the junction of the elements, moisture). Visually inspect the risers - whether there is moisture on them. Under the pipes should be dry, the pipes themselves should not be rusty. As a rule, in the case of a surface inspection of the apartment during acceptance, problems with the plumbing "float" at the most inappropriate moment - when you already moved, dismantled things and decided to try the bathroom. Therefore, a mandatory item in the list of what needs to be inspected will be plumbing and faucets. Open and close the water several times, do the procedure in the kitchen and in the bathroom. If ventilation is broken in an apartment, it will have to be fixed, but this “pleasure” is not cheap. If you prudently took with a match, check the hood with a flame (light and watch where it deviates). If you don’t have any matches or lighters with you, the check can be done with a regular sheet of paper. Attach it to the hood, if it sticks to the grid, then everything is in order. Check every shaft. Traction must be good. If the electrical wiring is not made to the panel, but throughout the apartment, be sure to check at the time of acceptance whether the sockets, including telephone sockets, work. Each electrical outlet can be checked using a charger and telephone. But experts advise to include a drill in them in order to establish whether the power grid can withstand more powerful equipment. Check the number of switches and sockets, make sure the fasteners are secure. Visually inspect the wires for damage. To make sure that lights work, you need a light bulb. It can be screwed into each cartridge, checking serviceability. The most annoying thing is a malfunction in the sewer system. Make sure that the bathroom is all right. Flush water from the tank into the toilet. Make sure the tank fills. 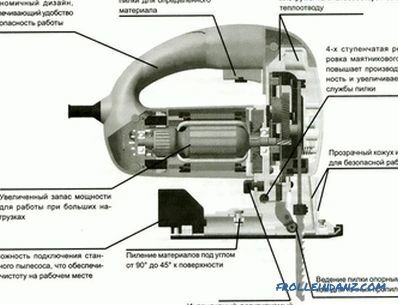 Check whether the mechanism will also work properly a second time. In some new buildings, boilers are installed in apartments. It is worth making sure that this device also performs its function properly (to do this, turn off the hot centralized water by turning off the tap, try heating the cold water and see if the boiler does its job and how well). Unfortunately, it is not always possible to see high-quality double-glazed windows and door designs in new apartments. But even if these structures do not have high operational properties, make sure that they are not damaged (in the form of cracks, scratches and crevices), that the handles are not broken, turn smoothly, the opening mechanism works without failures and creaking sounds, and for it launch does not require the use of additional physical effort. There should be no draft in the junction with the wall. 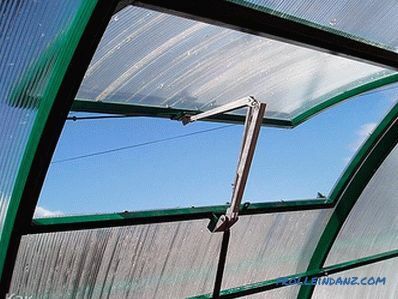 Of course, any, even the most dense glass unit will not provide such protection from cold and wind, like a wall, but still windows and doors must be airtight. Check the design from all sides: on the sides, top and bottom (in the case of the window - under the sill). A seal should be laid along the perimeter of the glass unit. Inspect the slots; they should be carefully sealed. To remove all doubts, take a piece of paper, open the window, stick it in the opening and close it. If the paper is firmly "stuck" between the frame and the casement, you will not be able to pull it out. This means that the window design is adjusted and will not let air through. Make sure the sill is durable. In this example, there is no seal along the contour of the window frame. At the front door, look at the lock to see how freely it opens and closes. To understand whether the doorbell is working, leave the apartment and call it. Neighborhood advice and a qualified specialist, for example, an independent construction expert, can help. It is worthwhile to talk in advance with all tenants who have already settled in the new house. They will be happy to tell about the identified defects and share their impressions about the state of the new building. Be sure to ask how the developer representative behaved when the tenants demanded to eliminate the defects. In addition, immediately prior to acceptance, it is worth going up to the neighbors from above and below to inspect their pipes and floors (ceilings) - whether there are any traces of flooding on them. You may bring an expert to whom you trust for acceptance. An independent construction expert will check the area of ​​the rooms and rooms, make the necessary measurements, determine the level of quality of construction and finishing works. If, in your opinion, the developer has not kept his promises and rents an apartment in a "indecent" form, further developments will depend on your decisions. But in any case, all defects must be fixed. All claims are entered into the defect list and as detailed as possible all irregularities, cracks, smudges, poorly functioning mechanism for opening doors or windows, the absence of insulation in the seams of the panels (in panel housing construction) are described. The terms for elimination are also indicated (if they are not registered, the developer will use the maximum period of 45 days). The document is filled in a free form. And the developer is obliged to sign it. After fixing the defects, the development of events can follow one of three possible scenarios. 1. You do not sign the act and require the elimination of the defects . Significant shortcomings. If blatant violations that make living in a new apartment impossible (significant shortcomings) have been identified, it is not recommended to sign the transfer act until the developer has corrected the violations. Even if it takes from 2 weeks to 1.5 months. Hacking. Also, experts advise not to sign the act if a frank bustle or builders vandalism is revealed. The interest holder has the right not to accept an apartment that does not suit him. In detail, each of the violations are recorded in the inspection sheet, and the developer is notified of the deficiencies found. Either the company will eliminate violations within a reasonable time (not exceeding 45 days), or will reimburse you for the costs of eliminating them (only the amount for which checks are available). But there is another opportunity - to agree to terminate the contract and return the money for the living space. If the parties do not come to an agreement, the problem is solved through the court. The trial will require an opinion of an independent technical expert who will confirm the validity of your claims. As well as checks confirming your expenses incurred to eliminate the marriage. Be prepared for the court to deny the claim if it deems the claims are not reasonable. 2. A shareholder may take an apartment with shortcomings and demand compensation from the developer. You can do the elimination of the defects yourself and demand compensation from the developer for the cost of the work. But in this case, you must have all the necessary documents confirming the costs incurred. In addition to receiving compensation, you can agree with the developer to reduce the purchase price. 3. If the terms of the contract are violated and it is not possible to eliminate the marriage, the interest holder has the right to terminate the agreement with the developer. Such a way out of the situation will be optimal if the identified defects cannot be eliminated. The developer must fulfill all obligations under the contract for which he received the money. Significant deficiencies also include apparent inconsistencies with the terms of the contract. If during the acceptance of the marriage was not identified, but was discovered because of poor-quality repairs or violations of construction standards, it is worth remembering about the warranty period. In housing, it is 5 years. At any time during the five years you are entitled to contact the developer and demand compensation for the costs of eliminating the deficiencies. If you cannot do this directly, contact the management company, it will redirect the complaint and control the review process of your appeal. You will see that no measures are taken to resolve the problem - collect evidence of your case and contact the court. 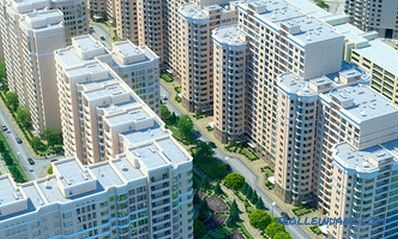 If at any of the stages you are faced with a clear reluctance of the developer to resolve the dispute, if the company goes to the trick - trying to delay the issue, if the warranty period has expired, you should apply pressure levers - to complain to the housing inspection or prosecutor's office. Or go to court immediately. Even if you purchase an apartment in a new economy class building, this does not mean that the developer is allowed to allow gross violations during the construction of the object. Remember, you have the right to refuse to buy if the "product" does not suit you. Require compliance with the obligations assumed by the developer. Now that you know what blatant violations developers may allow and how to properly accept an apartment in a new building, you will be able to take the necessary measures and ensure a comfortable stay in a new apartment.